Once more Cullen Bunn and Tyler Crook lead us through the life of Emmy and the new affect she’s having on the people of Harrow County. While the story has been extremely tense, driven by evil motives, thus far, issue number 5 leads readers in a surprising direction. The townsfolk no longer aim to slaughter Emmy. Fueled in part by fear and in part by hope, the people of Harrow County are beginning to look to Emmy for assistance, much as they once did to the old witch, Hester Beck. It’s a radical direction swing, but it offers a fine deviation from the insanely bleak arc of the first four issues. 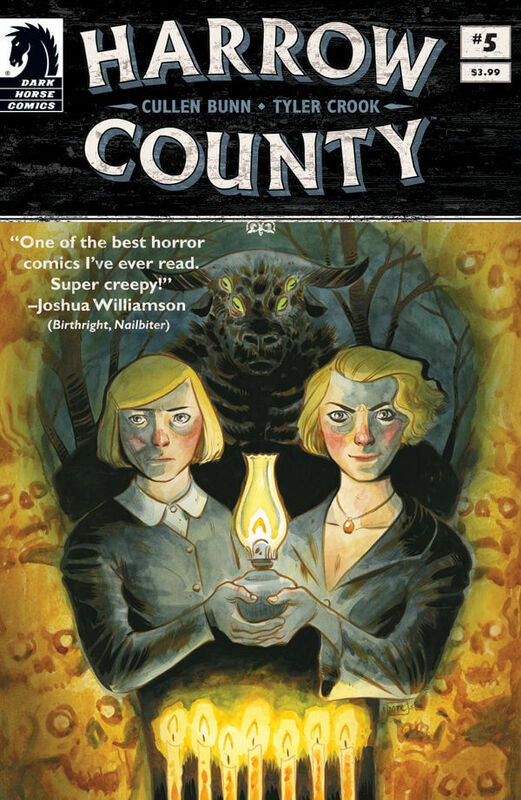 Could Emmy become a longstanding heroine – of sorts – to those of Harrow County, or is the cycle that overtook the county years prior an inevitability? We’ll have to wait out a few issues before we learn that potentially heartbreaking truth. For now we’re looking at a character in constant metamorphosis. Emmy continues to change and that is making for truly compelling material. What is also compelling is the unexpected arrival of her sister, a mysterious new player whose intentions we’re entirely uncertain of at this point. The mystery just doesn’t subside in Harrow County, as Bunn and Crook continue to deliver a sublime project every bit as addictive as the drugs that eat away at the weak minded of today’s society. What will issue number 6 bring us? Will we see a new string of outbursts from locals, or is Emmy safe in her new position of… healer, for lack of a better term?